Walter Mischer Sr. and Mary Mischer began acquiring land in Robertson County in 1960. Today the contiguous Rocking 7 Ranch spans some 7,500 acres along Farm to Market road 2096 and is comprised of 20 miles of quality caliche road ways. The Stephens and Collins ranches reside to the north adjacent to Twin Oaks reservoir and add an additional 1500 acres to the ranch. 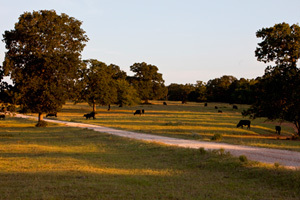 Within the ranch proper we have high fenced 1061 acre tract for Whitetail Deer and Red Stag. The properties are mostly composed of native pasture with Coastal Bermuda fields scattered throughout. Our livestock enterprise is primarily a cow/calf operation comprised of 1,200 Braford F-1 brood cows bred to Angus bulls producing Black Angus influenced calves.